Product code: ES7858 Categories: Antique, Antique Rings, Art Nouveau Jewellery, Art Deco Rings & Art Deco Engagement Rings. Here is a wonderful antique Art Nouveau era ruby and diamond ring made in France that in the early 1900’s and made in such a fabulous design that is destined to always be admired. Hand made in 18ct yellow gold and platinum, the ring is set with a lovely ruby that stands out so well and measures 0.25 carats. The clever design of the ring allows it to always be admired and highlights the ring so well. And then there are three lovely antique European cut diamonds that total 0.48 carats and six rose cut diamonds that total 0.08 carats. 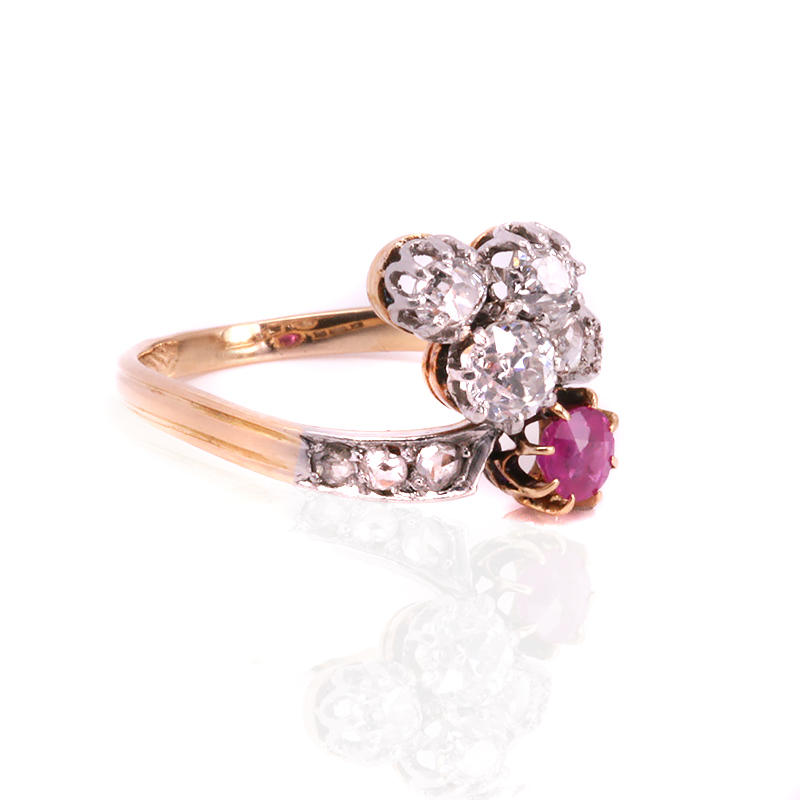 However it is not just the ruby and lovely antique diamonds that makes this ring, it is the unique design of the setting that really exemplifies what unique and beautiful jewellery was being made during this time. No matter the finger or occasion that this ring is for, there is no denying that it will always be loved, cherished and admired. Tag: Art Nouveau ruby and diamond ring. Set with European cut diamonds and rose cut diamonds, this amazing antique ruby and diamond ring was hand made in 18ct yellow gold and platinum.